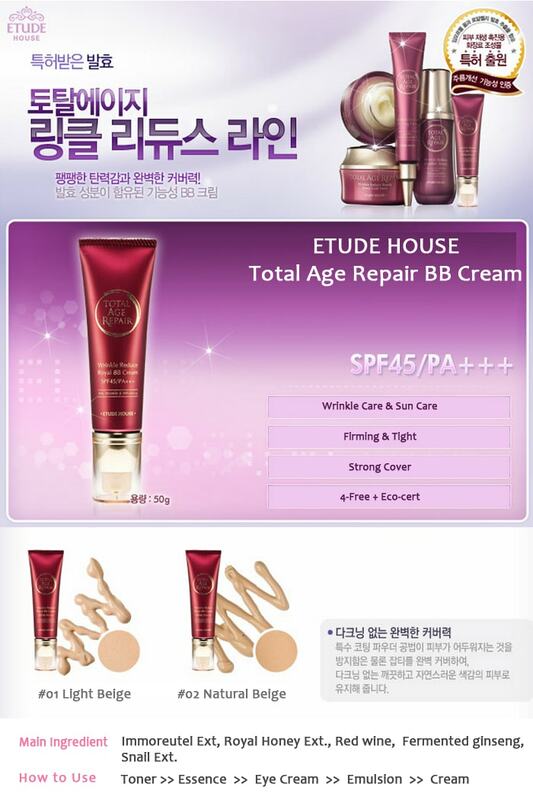 Say goodbye to wrinkles and preserve your youthful looks with the amazing Total Age Repair Royal BB Cream from Etude House. A popular Korean beauty product, this cream contains organic regenerative elements that nourishes your skin and controls wrinkles. It is endowed with fermentation of immortelle flower and royal jelly that retains your skins elasticity and keeps it firm. It has SPF45/PA + + + that blocks the harmful UV rays and safeguards your skin against sun damage. This easy to blend cream fuses with your skin to give you a brighter and more radiate complexion. It is talc and paraben free and is safe on your skin. Ingredients Immortelle flower, royal jelly extract fermentation, peptide, adenosine and sirloin blended hip oil. Non-paraben, non-talc, non-benzophenone, and non-mineral. Now keep wrinkles at bay and look younger with the ETUDE HOUSE Total Age Repair Fermentation Two-wa..